Art supplies for Plein Air painting. 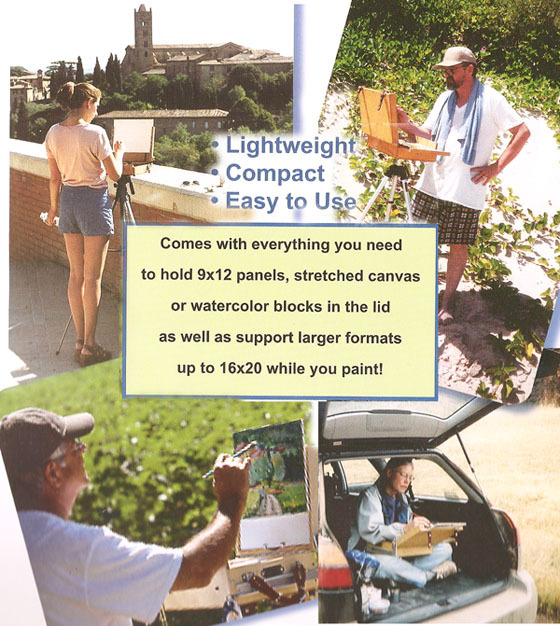 Plein Air Painting - Everything you Need! Call Mary for 25% off all products - paper, paint, supports! Want to paint outside--conveniently? 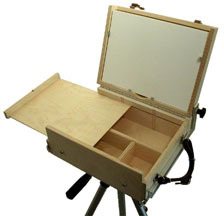 You can do so with one of our Guerrilla Painter Boxes! 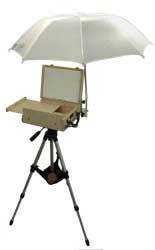 The great thing is that you don't HAVE to paint outside to get the great benefits from using our painter box set ups. These items can be bought as a set, or individually. No Cracking or Splitting - strong basswood laminate (no rainforest woods). Exterior finish. No Rust - we use exterior glue, stainless steel screws and aluminum hardware. Holds up to 4 Wet Panels - Completely enclosed. All Media - 1/8" or 1/4" panels, stretched canvas, watercolor blocks and pastel pads. Tie Down Strap for Oversized Panels. Adjustable Lid Bracket - positively locks in any position over a full 180° range with only one knob. 3 Large Storage Compartments - room for brushes, supplies and more than 10 tubes (37ml) of paint. Harness Leather Handle. Kit includes everything you need to use the tripod with to use a tripod with your Guerrilla Painter Box -- a tripod, a shoulder bag, two quick release plates, a mini multi tool. The heavy-duty professional tripod is a terrific value. Legs are independently adjustable for both length and angle for maximum stability under breezy conditions and on steep slopes. 3-way tilting head with bubble leveler and quick release plate to make attaching and detaching your pochade box or camera a snap. Very high-quality construction. 24" folded height, extends to 58". Weighs only 5.5 lbs. Dark green nylon bag with padded, adjustable shoulder strap and convenient zippered outside pocket. Having two quick release plates lets you keep one on your pochade box and one on your camera. The mini multi tool is handy for field adjustments for both the tripod and the box. 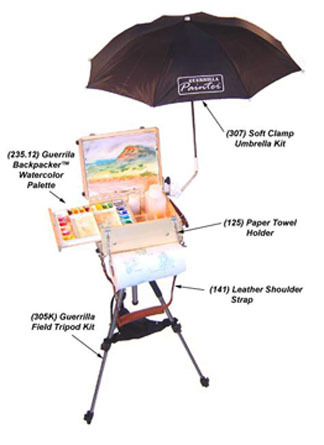 Mary is a distributor of Guerrilla Painter Products. Call her for a free catalog and 25% off! Arches watercolor paper and more!